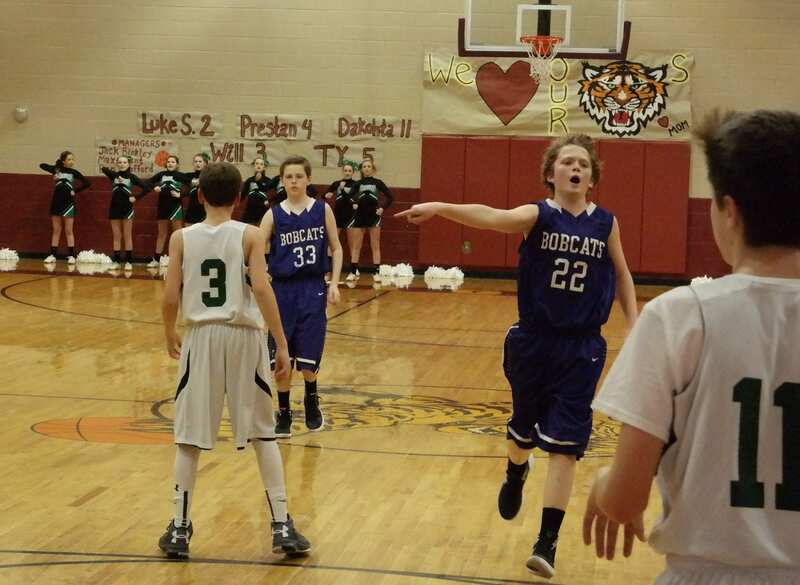 The seventh-grade Clear Creek Middle School Bobcats and Lady Cats are heading to the 2015-16 North Georgia Mountain League championship finals, after the Bobcats held off a late charge from the Pickens County Middle School Dragons and won 19-18 at Dawson County Middle School and the Lady Cats defeated the Riverview Middle School Lady Eagles 45-8, yesterday. As Ethan Banks (33) prepares to enter the Pickens defense yesterday, Braden Jenkins (22) shouts instructions to the Clear Creek offense. 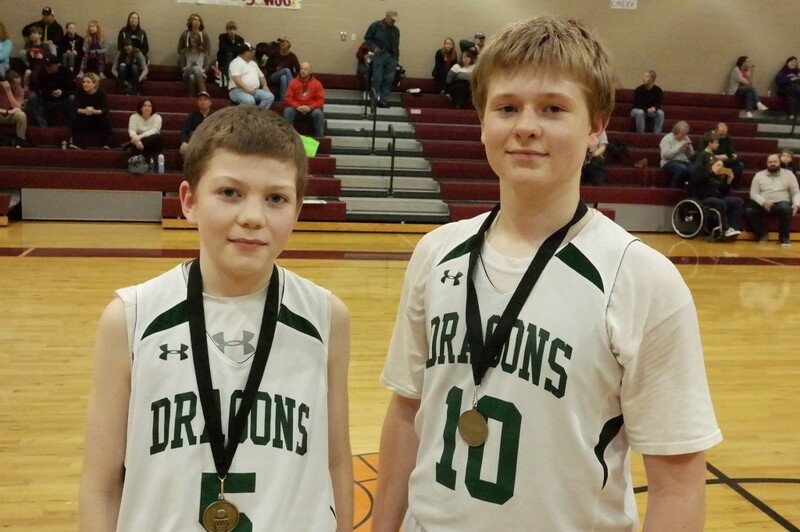 The Bobcats bested the Dragons 19-18 at Dawson County Middle School, to advance to the seventh-grade boys North Georgia Mountain League championship game. (Photo by: Kevin Hensley). A rebound-filled opening period resulted in a slow offensive first quarter for both Clear Creek and Pickens, with the Bobcats edging ahead 5-4 by the end of the period. The Dragons failed to generate more points before halftime, but Clear Creek only managed to widen its lead to 10-4 by the break. The momentum picked up in the third quarter. Dawson Turner kickstarted the second half with a basket for PCMS, its first since the opening period. 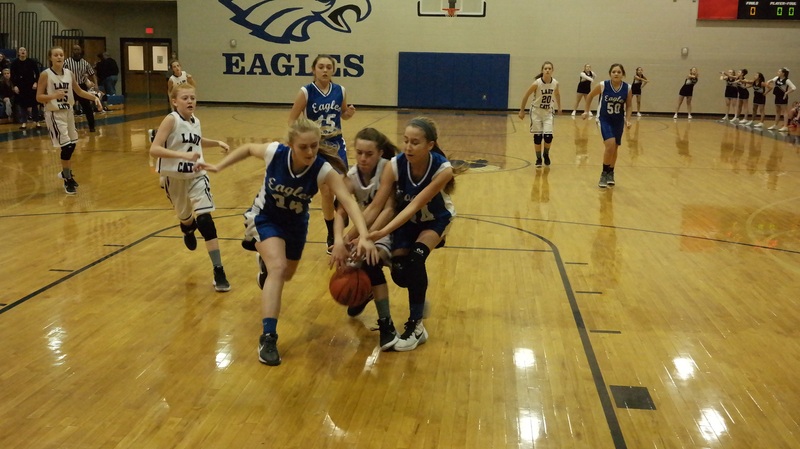 However, CCMS continued to respond and led 17-10 at the end of the third. With 35 seconds remaining in regulation, Noah Sutton tied the game 18-18 with a bucket for the Dragons. The comeback fell short, as Braden Jenkins sank a free throw seconds later and the Bobcats held off Pickens en route to the victory. 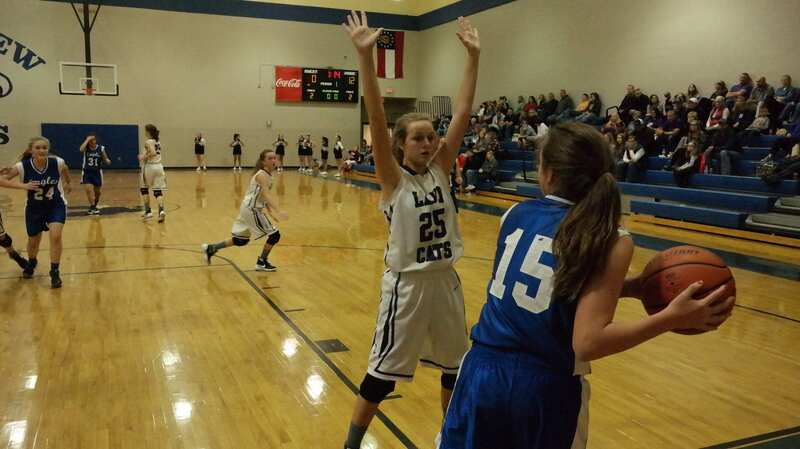 Seventh-grade Lady Cat Emma Callihan (25) looks to break up Lady Eagle Shyla Sheffield’s (15) in-bound pass. 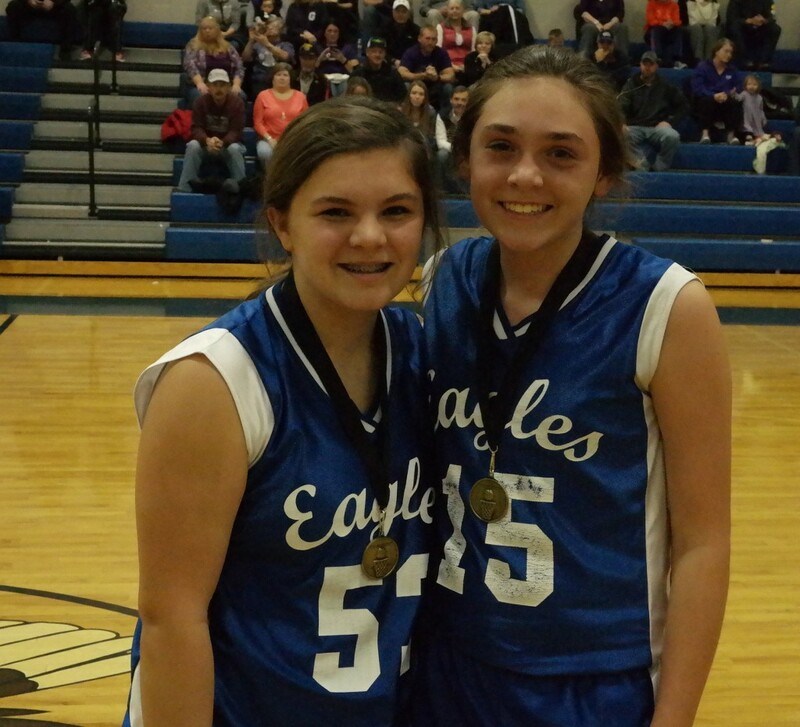 Clear Creek defeated Riverview 45-8 yesterday, to advance to the seventh-grade girls NGML championship game. (Photo by: Kevin Hensley). A 10-point first quarter for Elly Callihan, coupled with 11 opening period rebounds, gave the Lady Cats all the momentum they needed for the game. Riverview trailed 17-0 after one quarter and only managed four shots in the first half alone, foul shots that each missed. Clear Creek went on to build a 28-0 halftime advantage. Lady Eagle Shyla Sheffield broke up the shutout with a free throw 49 seconds into the third quarter. Ansley Anglin later added a bucket, but thanks to a dominant defensive third quarter from Lady Cat Emma Deyton (six rebounds and two steals), Clear Creek continued to widen its lead and constructed a 39-3 gap by the end of the period. With reserves playing the majority of the fourth quarter for CCMS, the Lady Cats only scored six points in the final quarter of the game. Kenzie Smith sank a three for RMS and Sophie Chomellii provided a basket for the Lady Eagles in the last six minutes of the contest to put the final score at 45-8. Braden Jenkins: Nine points, three rebounds, 2/4 on free throws. Brady Sanford: Three points, three rebounds. Cameron Weaver: Three points, five rebounds, two steals, two blocks, 1/2 on free throws. Lewis Mulkey: Two points, two steals, one rebound. Isaiah Hopper: Two points, three rebounds, one steal, 0/2 on free throws. Owen Moss: Six points, one steal. Noah Sutton: Six points, three rebounds. Ean Goodwin: Four points, five rebounds, 2/2 on free throws. Dawson Turner: Two points, four steals, two rebounds, 0/2 on free throws. Jordan Pendley: Two steals, 0/2 on free throws. Elly Callihan: 14 points, seven rebounds, three steals. Emma Deyton: Seven points, 10 rebounds, two steals, 1/2 on free throws. Emma Callihan: Six points, five steals, four rebounds, 2/3 on free throws. Natalie Thomas: Five points, one rebound, 3/4 on free throws. Jayd Hamby: Four points, two rebounds, one steal. Bethany Burnette: Three points, three rebounds. Hope Colwell: Two points, four steals, two rebounds. Lark Reece: One rebound, one steal. Kenzie Smith: Three points, three steals. Ansley Anglin: Two points, five rebounds, one steal, 0/2 on free throws. Shyla Sheffield: One point, two rebounds, two steals, 1/2 on free throws. Elizebeth Keys: One steal, 0/2 on free throws. Carley Lamb: One steal, 0/2 on free throws.